TrackR Pixel, Wallet 2.0 Announced | Nerd Much? If you’re prone to losing things, you’ve probably heard of TrackR by now. And this morning, the company announced two new products ahead of this week’s CES 2017 in Las Vegas, the TrackR Pixel and the TrackR Wallet 2.0. The TrackR Pixel brings a much smaller item tracker to the company’s lineup, and with that smaller size also comes a smaller price. The pixel is similar to the TrackR Bravo in that it can quickly locate any item that it’s attached to, but it comes in smaller than its predecessor. It measures just 26mm in diameter and is just 5mm thick (they used the comparison of two quarters stacked). This makes it one of the smallest item trackers on the market. Instead of having the aluminum casing as the Bravo, the Pixels will use plastic, allowing it to have a slightly cheaper price. The pixel will come in at just $24.99 and will be available in nine colors, including blue, yellow, pink, orange, and more. Also announced this morning is the more niche TrackR Wallet 2.0, which comes in at just 2mm thick (or roughly the thickness of two credit cards). It has the same form factor as a typical credit card as well, so it’s perfect for sliding into your wallet. It’s great for those who frequently misplace their wallet, and it’ll be available for $29.99. So how do TrackR products work? 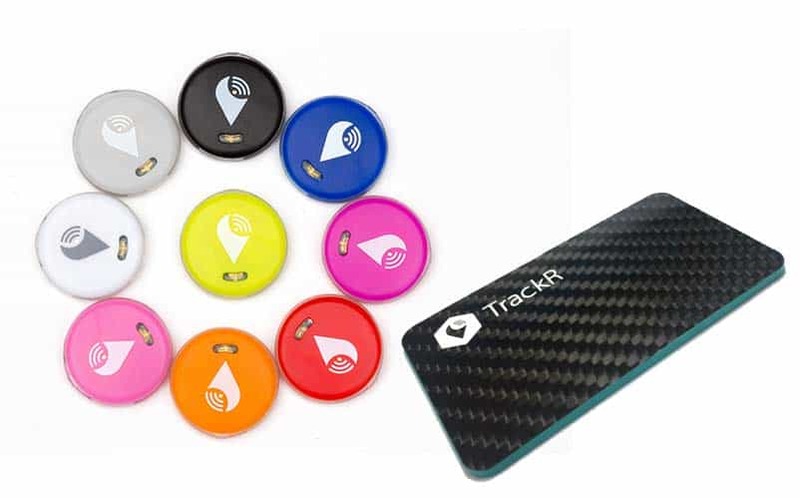 Basically, they connect to an app on your smartphone via Bluetooth to allow you to find the TrackR product if it’s within 100 feet away from you. You can attach the product to virtually anything — your phones, tablets, keys, wallet, etc — and then when you need to find the product you frequently lose, you can just tap the button in the app and your TrackR product will ring loudly. What’s more, when any other TrackR app user comes near your product, it’ll be automatically updated in your app (in case you’ve REALLY lost it and it isn’t within 100 feet of your location). The company also showcased the new TrackR Atlas which serves as a hub for your TrackR products and creates a layout of your home, detecting any TrackR product in your house and showing you on a companion app exactly where in the house it’s located. What’s more, it’ll sport Alexa functionality, so you can ask Alexa where your damn phone is when you need it. The Atlas will be available for $39.99. All three products will launch in Spring 2017, and they’ll be available for pre-order soon.